Into the wild TV will take the viewer on hunts for many different species in many different parts of the globe. With host, Jason Petersons decades of filming, field production, and more off hunting experience the viewer will be entertained with world class videography, and a storyline that will keep you on the edge of your seat. In 2004, producer Jason Peterson decided it was time to create his own TV show. 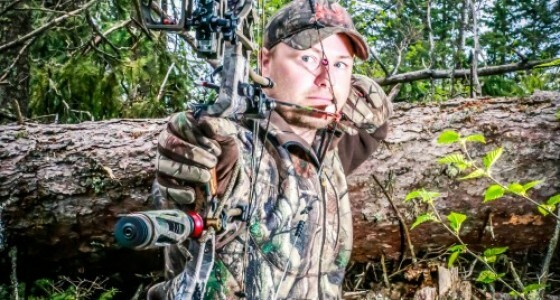 A veteran of the outdoor television industry, Jason cut his teeth working with such notables as Jim Shockey, Hank Parker, Ron Spomer, Kim Hicks, Texas Trophy Hunters and Cabela’s TV.Through this experience, Jason learned the value of superior footage, and a great story line, no matter what the quarry or venue.His show, Hunting Canada and Beyond, was the very first Canadian-produced hunting show.It quickly gained a significant following and became widely known not only for its production value but for the tremendous and impressive animals Jason consistently harvests.But with success, comes change. So, starting in 2014, the show will be known as Jason Peterson’s Into The Wild TV. With the change will come another huge leap in production quality and a continued commitment to providing best-in-class videography of world class hunts for amazing animals, its far from just “the kill”, its the whole story, from the setup, preparation, etc, to the travel, and into the whole hunt itself.